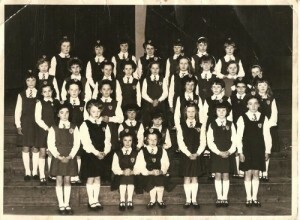 Saint Catherine’s Convent School, Rathoath Road, Cabra West, Dublin. Photo includeds from back row L-R: Irene McWilliams, ?, ?, Betty Comerford, Noeleen Ward, ?, Paula Cahill, Phylis Lambert, Eileen Bannerman, ?, ?, Geraldine Kitson, Patricia Duffy, Sandra ?, Elizabeth McGrane, Carmel Scully, Noreen ?, ?, ?, ?, ?, ?, ?, ?, Theresa Mohan, ?, Deirdre Mooney, ? McGuirk, ?. Can anyone out there help fill the gaps of missing names?